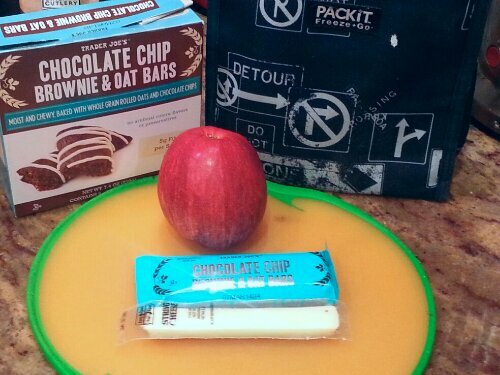 I love this “Pack -it” lunchbox for a snack package, it has a buit in cooling gel. You freeze the bag overnight, add food in the morning and it keeps it cool just in time for snack time. 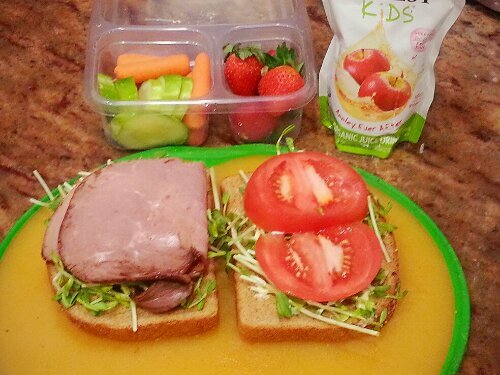 Pea shoots, roast beef , a little bit of aioli (garlicky mayo), and tomato sandwich, with baby carrots, cucumbers and strawberries. Love pea shoots and broccoli sprouts,they are sweet and crunchy and full of nutrients. I buy pea shoots in Trader Joe’s or Fairway market, and grow my own broccoli sprouts. Well, actually I have been putting off starting a new batch for a few days, but will definitely start it tonight.